President Ram Nath Kovind on Saturday said that the solution to the protracted Naga political issue is very near. Kovind stated this while inaugurating the Hornbill Festival and State Formation Day celebrations of Nagaland. “With the support of the people of the state, of civil society institutions and all stake-holders, there is an opportunity for lasting peace,” he said. His remarks came even as Nagaland Chief Minister TR Zeliang pleaded for the final settlement before the 2018 Assembly elections in the state. Kovind said that “after years of conflict there is hope. Aspirations should be met soon”. He didn’t though commit on any time-frame for the solution to be sealed, and no mention of solution before the elections were made. Kovind further observed that Nagaland presents a unique situation in which there is a government without any opposition. That, he said, can work in favour of the Nagas as a solution can be worked out without any hurdles. He asserted that Nagas, after coming through many trials and tribulations, deserve peace. 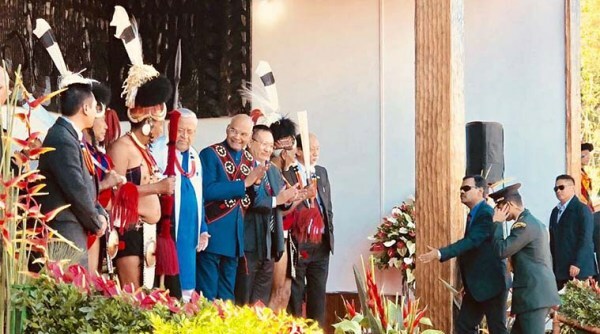 “Nagaland deserves this, all of you deserve this, the Naga youths deserve this”. The Hornbill Festival coincides with the celebration of the 54th Statehood Day of Nagaland.